The sound quality is great, but too many edits are evident. Among them are a hopeless vocal edit on 'Polk Salad Annie' (Polk A Little Sock Salad'). You can still hear Elvis talking about "overweight little woman etc...", but it is only a bleed from other microphones. This vocal edit is utterly pathetic, really!! What's the harm!? FTD is obviously going for the old Parker - good clean fellow - philosophy! I'm embarresed by this, really! Anyway, one of the most sought after albums, has effectively been reduced to - only - a good sounding, but poorly produced CD. A shame! Previously two songs from this event have been out, both 'You've Lost That Loving Feeling' and 'Sweet Caroline' was first found on Elvis Aron Presley released in 1980. 'You've Lost That Loving Feeling' was actually a spliced version of "take 1 and 2". 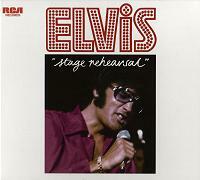 After the August 1970 rehearsal, some songs from 1972 and 1973 (also Las Vegas rehearsal) are added. All have been bootlegged, but the fidelity is slightly better here.